It’s no secret that the best restaurant design affects your experience of the food. At best, it enhances, even better, it defines it. Anyone who drives by the newest structure on 40th and Campbell will wonder what’s happening inside. 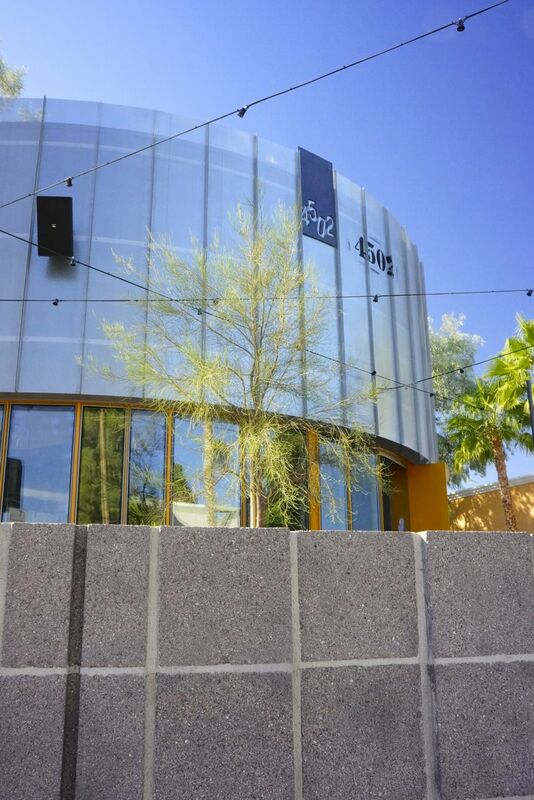 It’s been a secret, a jewel-box of a design created specifically for its purpose. A rarity in restaurants so commonly adapted from existing space. And a restaurant it is. 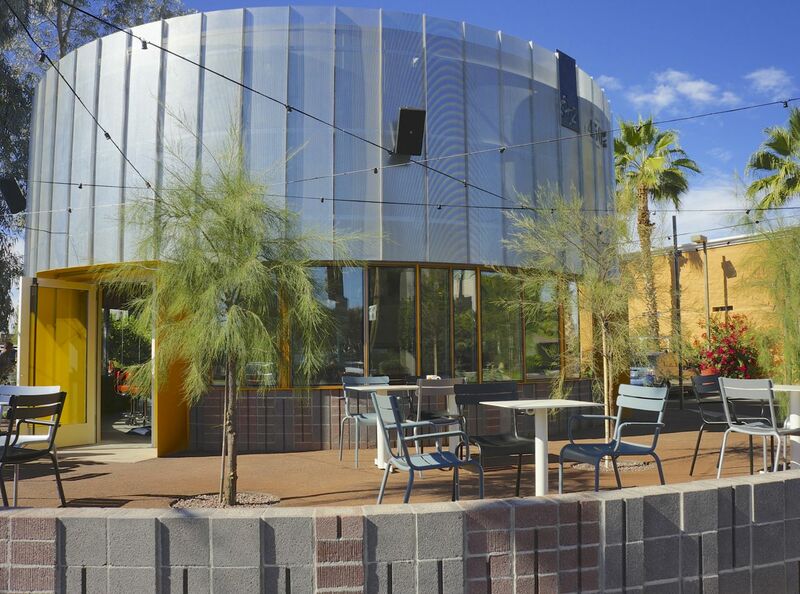 It’s a Cafe designed by Architect Will Bruder. 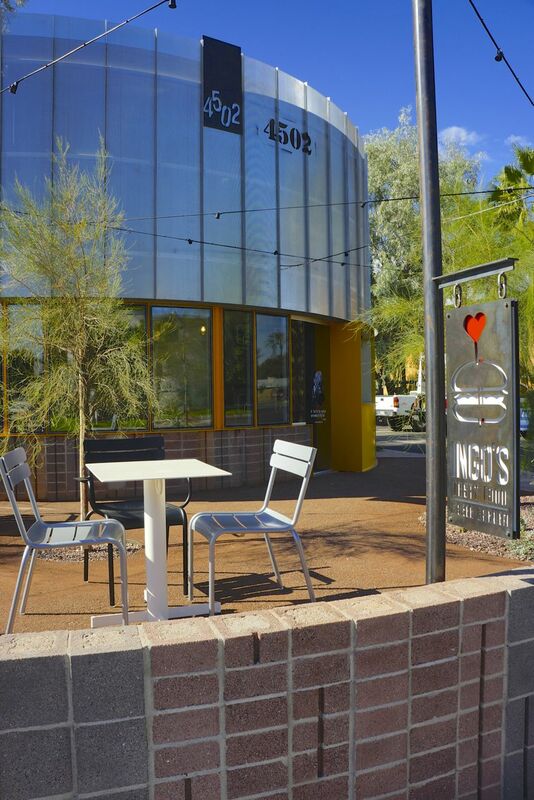 Designed with a walk-up eating counter and picnic garden seating, it is clearly unlike any experience we have here in Phoenix. Ingo’s will no doubt inspire comments, questions and copycats. But this one’s the original folks! The menu is simple and clean with homemade pretzels, house-made veggie burgers, grass fed beef burgers and a brown rice meal. Beer & wine are offered as well. 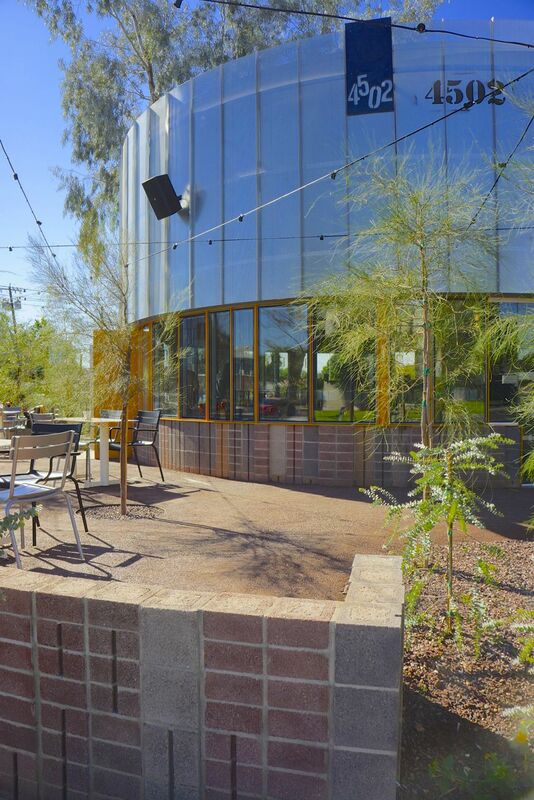 Relaxing in the beer garden patios under sun dabbled soft shade is not to be missed. Inside, the counter is the center of attention. Bright orange swivel chairs are at once new and remembered: this is a fresh and modern version of a favorite food stand of your past. Yet we like the permanence that the architecture brings. It’s likely that this is one design that will anchor food memories for years to come. The name is fun and has a great back story too: “Ingo’s” is inspired by the name of one of the partner’s German music teacher when he studied violin and guitar at the tender age of seven! We think the new Ingo’s might just live on to inspire even more great design. We recently had one of the better meals there that we’ve had in a while and the experience? Simple, fun and new. We took our meal at the counter, next time we plan to enjoy the open air and move out to the Patio. If you’re looking for an original experience, this is it. 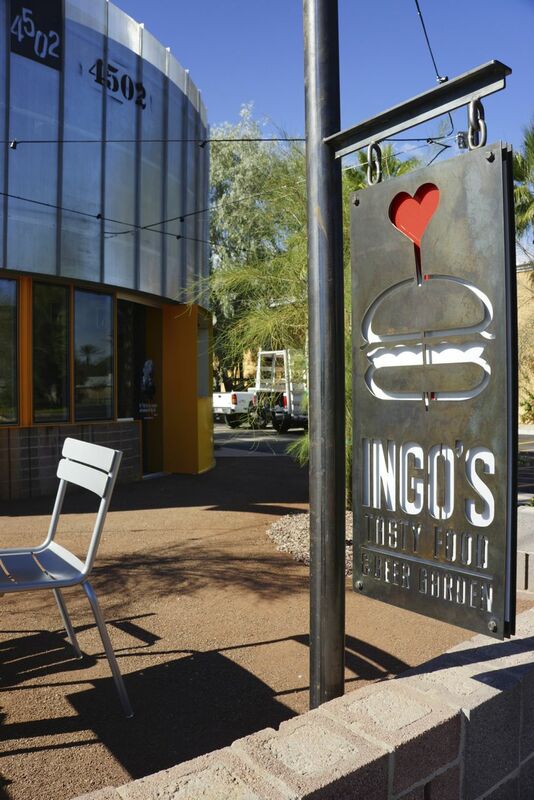 Ingo’s is open everyday for lunch & dinner and all of the menu items are available to go. But with design this interesting we wonder who would want to leave?